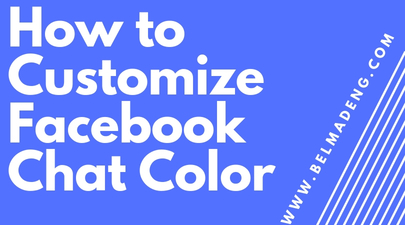 How to Customize Facebook Chat Color: Let us get started with how to change the default blue color of the Facebook chat background. When you open a conversation with people on Facebook, the color of the chat box is blue. You can also click here to see our previous post on how to change Messenger conversation emoji. 2. Click on the Messenger symbol at the top right corner of any Facebook page. That will open the list of the people you chatted with. 3. To open the conversation or chat box, you'll need to click on the name of the person whose chat color you wish to change. 6. You'll now need to pick or select a color for the conversation. Do that and the color change will be applied ASAP. Bear in mind that everyone in the conversation will see it. Note that the change can only be applied to the chat box of the person whose chat color you changed. Another thing that is worthy of note is that people in that conversation will get to know that you've changed the Facebook chat color. That is how to change the color of your Facebook and Messenger chat box.